– This is a particularly important quote, because whilst the father of Ed Miliband was fighting the Nazis by manning a destroyer during the heroic Normandy landings, the great-grandfather of the owner of the British-loving Daily Mail was back in the safety of Britain, supporting Hitler. “My dear Price, I am glad you have become a director of the Daily Mail, and I am sure that your very popular and widely circulated newspaper will continue to be a sincere friend of fascist Italy. With best wishes and greetings, Mussolini. – This was in the same year the Nazis implemented the Jewish boycott, leading to state managed harassment, beatings, and forced removals of Jews by Nazis. Less than a year later, the Nazis would engage in what is commonly referred to as the “night of the long knives”, in which political critics of the regime were brutally murdered. Lord Rothermere believed at this point that the Nazis bloodthirsty tyranny was being misrepresented. “…a well organised party of the right ready to take over responsibility for national affairs with the same directness of purpose and energy of method as Hitler and Mussolini have displayed”. – This makes the “rapid nationalists” quote of Ralph Miliband seem completely uncontroversial. The Daily Mail openly supporting the methods and purpose of Hitler and Mussolini, for the sake of Fascism in Britain. 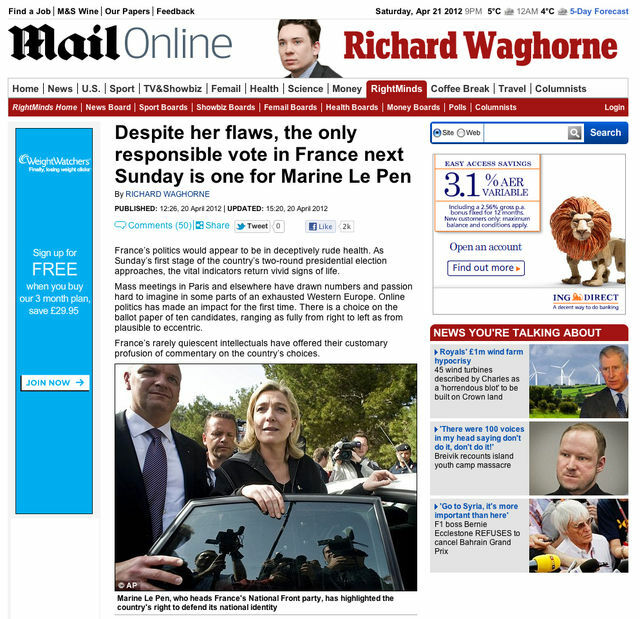 – This is at a time when Daily Mail editorials were used as propaganda, by the Nazis. – Rothermere was fully supporting an apparent Nazi (not German) right to empire in Europe. The annexation of Sudetenland lead to its Jewish inhabitants rounded up and thrown into concentration camps, alongside any left leaning opposition in the territories. A month after Rothermere sent his telegram of support for the “bloodless solution”, Sudetenland and the rest of the Nazi empire experienced the truly horrific night of broken glass, in which 91 Jews were murdered, Jewish homes and businesses destroyed, and 30,000 Jewish men, women and children rounded up like animals and thrown into concentration camps. A letter from Rothermere in 1939 (six years into Nazi control of Germany, and thousands of political murders later) congratulated Hitler on his success in Prague, and urged him to move on to Romania. 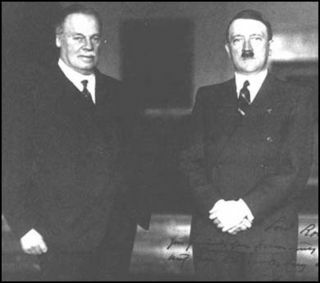 Rothermere had befriended and was paying a Nazi spy in Britain – Stephanie von Hohenlohe – to further his contacts in Nazi Germany, and pass correspondence between himself and the regime. The brutality of the regime at this late point was obvious. Rothermere and the Mail turned a blind eye to it. So, when you hear the Daily Mail insist that it is relevant to point to brief notes from the mid-20th Century childhood of the father of a political leader in the 21st Century as proof of his “hate” for Britain, and as an attack on his son today… we must keep in mind that during the same period of time, their paper and its owner (the great-grandfather of its current owner) were hoping British troops would fail (including the bravery of Ralph Miliband), and openly praying for a Nazi victory, and dictatorial Fascism across Europe and Britain. This entry was posted on Tuesday, October 1st, 2013 at 11:50 am and is filed under Uncategorized. You can follow any responses to this entry through the RSS 2.0 feed. You can leave a response, or trackback from your own site. 27 Responses to My Dear Fuhrer: A Quick History of Daily Mail Fascism. Deeply disturbing, yet not remotely surprising. Any source for the Hurrah For The Blackshirts full text? Thanks in advance. The Daily Mail’s main reason for withdrawing support for Moseley’s Blackshirts were threats by advertisers to withdraw their revenue from the paper. I have just re-read Scoop, by Evelyn Waugh. It was an e-book, and it contained a series of letters written by Waugh. They were written in 1935, from Ethiopia, were Waugh was covering Mussolini’s invasion of that country, for the Mail. What caught my attention was that Waugh was most unhappy with the Mail’s pro-Italian stance. Well then I became curious as to what degree the Mail had been pro-fascist in the run up to WWII, and came across this very informative site. This is a pointless article. The Daily Mail is a reprehensible paper at times, but your assertion that it was on the side of the Nazis during WW2 is nonsense. ‘Openly praying for a fascist victory’? The mental gymnastics required to come to this conclusion really are incredible. Again, not defending the vile smear on Miliband-but most people can see for themselves what an awful thing it was. Drivel like the article above contributes nothing and just makes you look silly (more so than the Mail). The Daily Mail still supports fascism even today. 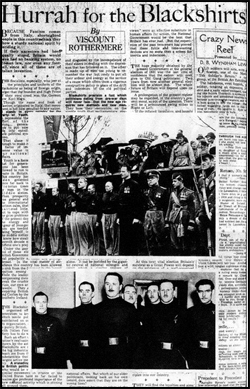 The Daily Mail cannot say a lot about LAbour and there mp’s, when it supported Hitler and the nazi’s, Lord Rothmere, should have been arrested and tried as a traitor, and it is still a fascist paper today. Is there any other party that overtly supports France for the French than the National Front? If not, what other party could the Daily Mail possibly support in good faith? This is the biggest, filthiest, lie of the lot. The Mail, nor its owners, nor its employees, wanted no such thing. Rothermere was not a Nazi; this is all easily shown. If the Mail had been gung-ho for Nazi victory, it would have been banned at any point between 1939 and 1945; it was not, because it was not for Nazism. As for the Marxist Adolphe Miliband, like most foreigners of that era (and the Americans are included in this), they saw British ‘imperialism’ as being as bad, if not worse, than Nazi imperialism in Europe. That the leader of the opposition grew up in a household headed by such a man is more relevant than your outright lies that the Daily Mail was praying for a Nazi victory. You mean the war veteran and Marxist Ralph Milliband? Are people to be barred from office because of their parents beliefs? The “Night of the Long Knives” was primarily designed to remove Rohm and other senior SA leaders who were embarrassing Hitler with their calls for the regular army (Wehrmacht) to be scrapped and replaced by a People’s Army, led by the SA (brownshirts). Hitler was also enabled to cement his relationship with the army by demanding – and receiving – a personal oath of loyalty from every member of the armed forces. The Daily Mail for the bigots and fascists to read to fuel their hatred. NEVER CHANGED.